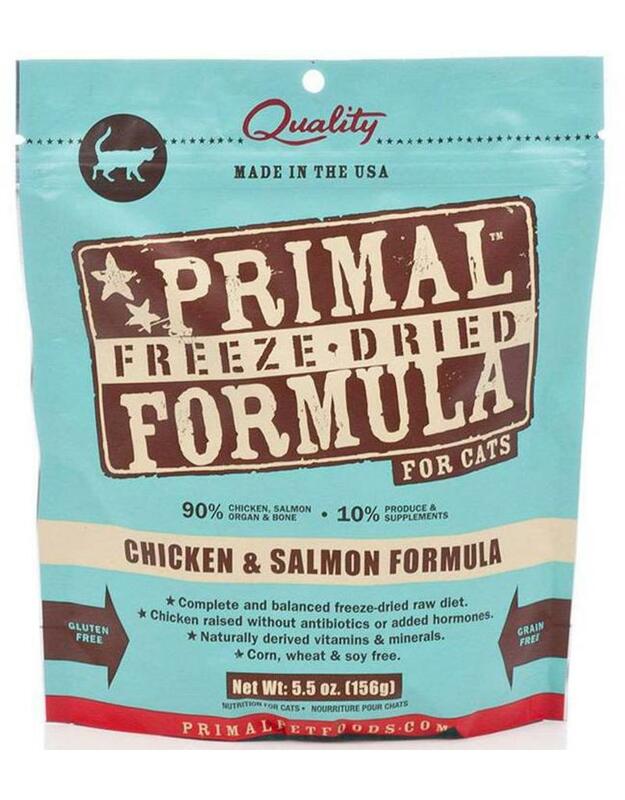 Primal Nuggets Freeze-dried Cat Food offers the convenience and benefits of a well-balanced, safe and wholesome raw-food diet without having to grind, chop, measure or mix it yourself. Only the freshest ingredients are used, including real meat that’s free of antibiotics, steroids and added hormones. Certified organic produce, certified organic minerals and unrefined vitamins are also incorporated to fortify this complete and balanced diet. The combination offers optimum levels of the amino acids, essential fatty acids, natural-occurring enzymes and necessary vitamins and minerals that are the building blocks for your cat's healthy biological functions. Primal Nuggets allow you to give your furry feline friend all the benefits of a raw diet in a convenient freeze-dried form. The variety of ingredients mimics what the diet of animals in the wild are in a superior bio-available composition. It's grain and gluten-free, and doesn't contain any corn, wheat, or soy, making it great for cat's with sensitivities. Vitamin E acts as an antioxidant and taurine helps your cat maintain optimum retinal health. The nuggets are naturally preserved without the need for any synthetic preservatives.